Ordinarily, a resort with only four tennis courts does not show up on my radar, but it is news when what had otherwise been a golf-centric property with a boutique hotel not only adds tennis courts but also backs them up with a credentialed tennis director and a livingroom-like pavilion for players to chill out. Situated on 1,700 secluded and minimally developed acres in the foothills of the Santa Cruz Mountains, 27 miles southeast of San Jose, it is a convenient hideaway for the nearby Silicon Valley crowd. Lodging consists of a mere 45 suites and three four-bedroom homes; however, there is a full range of diversions, including an 18-hole Robert Trent Jones Jr. golf course, a spa and fitness center, a vineyard and winery, and several restaurants not open to the public. Tennis director Benjy Robins played on the ATP Tour before going on to a multi-faceted career that included managing the ATP Tour, coaching college tennis, and founding his own sports marketing firm until settling here in 2010. 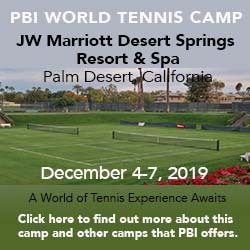 He freely admits that the tennis program at Cordevalle is "a work in progress," though he has started a summer junior tennis camps and begun to introduce clinics as mixers as he feels his way toward that his clientele wants. If you're headed that way, check in with Robins to see what he'll have going on during your stay. Courts & Fees. There are four hard courts available for $25/day. Travel Instructions. The nearest airport is Mineta San Jose International Airport (SJC), about 35 minutes to the north, and San Francisco International (SFO), roughly an hour's drive to the north. General Tourist Information. St. Martin is 45 minutes' drive from the Monterey Peninsula, so visit the Monterey County Convention & Visitors Bureau website or contact them at P.O. Box 1770, Monterey, CA 93942. Phone: 877-MONTEREY.